Larry is a Local Historian and Illustrator. 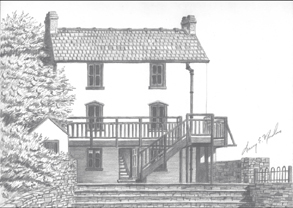 He is best known for his line drawings of industrial sites and historical buildings of Welsh interest. Larry, of Danville, PA, has specialized in mining and industrial history. The Dylan Thomas Boathouse is available as a limited edtion print (£60/$115) or as a greeting card(£3/$6). The prints are numbered and signed by the artist. The blank cards are 210mmx145mm with envelopes. For purchase information, contact: Oriel Sargaso. 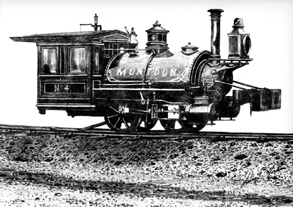 The Montour was used in the 19thC in Danville Pennsylvania to haul iron rails from the Rough & Ready Rolling Mill iron works. A print of this drawing (£10/$20), along with others may be purchased through Oriel Sargaso. 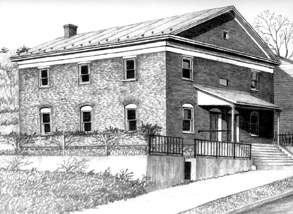 The Welsh Congregational Church in Danville PA was built in the 1800s for the Welsh immigrants who were responsible for building the iron industry in Pennsylvania. Dr. Joseph Parry was a member of the congregation. A print of this drawing (£10/$20) may be purchased through Oriel Sargaso. Please contact Oriel Sargaso for purchase information. Artists showing in this online gallery have agreed to show their work at Oriel Sargaso by invitation. Images are the property of Oriel Sargaso.